Either i did not find the ability to group the tables, or there really is not. I would like to be able to group tables as in phpMyAdmin. This is useful for grouping tables of different modules. It was also good to create subgroups for submodules. Hi, I'd like to have this feature, too - but primary on table names inside of a database (no submodules as suggested are neccessary here). 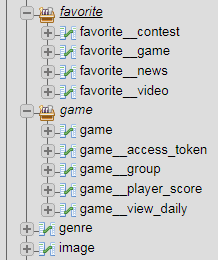 I mean that the tables from the module/submodule of my application are conveniently grouped when viewed in HeidiSQL. On the current project, i have >20 logical modules and submodules (grouped tables) in DB. my emphasis was on "here"
If author can make groups and subgroups within the one issue/feature, then why not. If this is difficult, then of course it's best to make only groups. Without subgroups, we will survive.